BBall Tic Tac Toe: Each team gets a basketball. Students from each team will run up to a designated shooting spot on the floor and take one shot. (Free Throw) After the student shoots, the next person from that team gets a turn to run up and shoot as a relay style game. If the student shoots and makes the shot in, that student then gets to write an "X" or an "O" on the Tic Tac Toe grid on the board. The game continues, until one team has gotten 3 X's, or 3 O's in a row. (Or until all spaces have been filled, in which case there is no winner. The winning team is awarded 10 points. All ages have a lot of fun with this game as it incorporates basketball and tic tac toe. All students get to participate as long as they have behaved and worked hard during the English drills of the class. 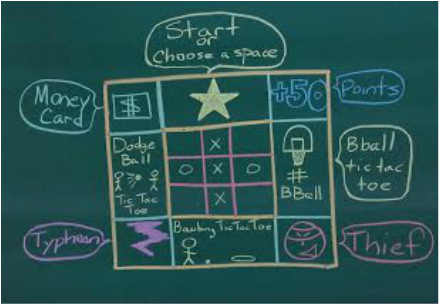 Bowling Tic Tac Toe: Place a Hoop on the floor away from where students are sitting. Each student gets a chance to try to roll a basketball into the hoop and have the ball remain in the hoop. (It is difficult to roll the large balls into the hoop on the floor as it simply rolls over the hoop or is deflected off the hoop when rolling slowly) If the student can get the ball to remain in the hoop that student may write an X / O on the tic tac toe grid for their team. The first team to get 3 in a row is the winner. *Students alternate turns from team to team to roll the ball into the hoop. Dodgeball Tic Tac Toe: Choose one student from each team. Each student has a ball and stands back to back in the middle of the classroom. The teacher Counts "1": students take a step away from each other... "2": Students take a second step away from each other... "3": Students turn and throw the ball at the other student... (Like an old fashion duel) The student that hits the other student first is the winner and may write an X / O on the tic tac toe grid for their team. *If the students miss each other, they must run to pic up the balls again and throw again to hit the other student. All the games are lots of fun for all ages. Play until there is a winner of Tic Tac Toe, or until all the spaces are filled. For older classes, when they land on a Game Space, I allow the class to choose which game they would like to play.